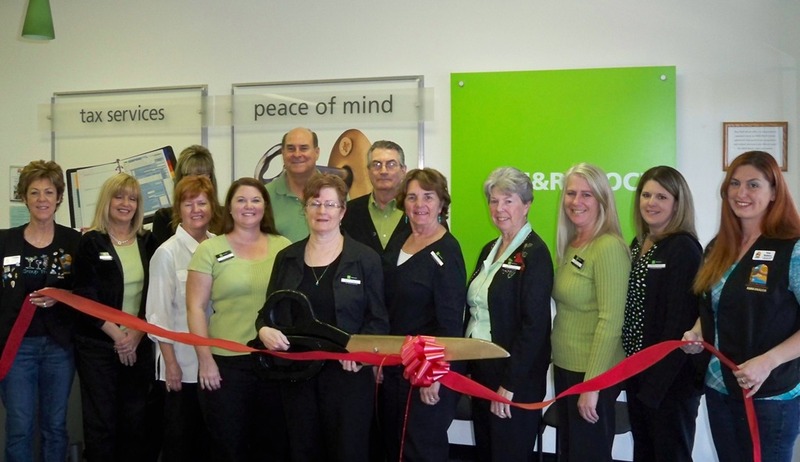 The Lake Havasu Area Chamber of Commerce held a 15 year membership Anniversary for H & R Block located at 55 South Lake Havasu Avenue #C.
H&R Block has been preparing taxes in Lake Havasu City for 33 years and have been members of the Chamber for 15 years. Sally Ann Wade, Franchise Owner and Enrolled Agent have been preparing taxes for 25 years in Lake Havasu City for H&R Block. Their staff of licensed tax professionals collectively has over 100 years of tax experience. Call 855-4991 for answers to your tax questions, they are open year round. Pictured from left to right are as follows; Chamber Ambassador Virginia Chambers, Linda Lichtenstein, Joan Craswell, Jeanne Zegers, Sally Ann Wade, Diane Marciniak, Marley Becker, Stephanie Odom, Shonda Cleveland. Employees from left to right in the back row; Lorrie Marsh, Richard Hawkins, Pete Clouge and Chamber Ambassador Amy Walters.